What I’ve noticed in recent days is that a lot of people have found my website by searching for 9-11 photos. I don’t have any. I prefer to commemorate the life of the World Trade Center, rather than its death. I prefer to remember the Twin Towers as an out-sized architectural conceit that, by the time of its destruction, had finally begun to fit into the fabric of New York. It was no longer the world’s tallest building. It wasn’t a symbol of anything. It was just a living, vital piece of our city. 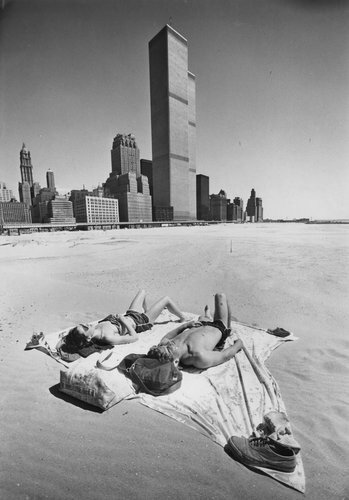 My favorite visual account of the life and death of the Twin Towers be found on the website of photographer Kristine Larsen. She lived a couple of blocks from the towers and routinely took pictures on the surrounding streets of people going about their business. Always, in the background, there was this massive presence. After 9-11 she took photos in the same streets, from the same angles. In her series, Before and After, she’s paired the two sets of photos. My favorite single portrait of the World Trade Center is the one above, by Ann Rhoney. 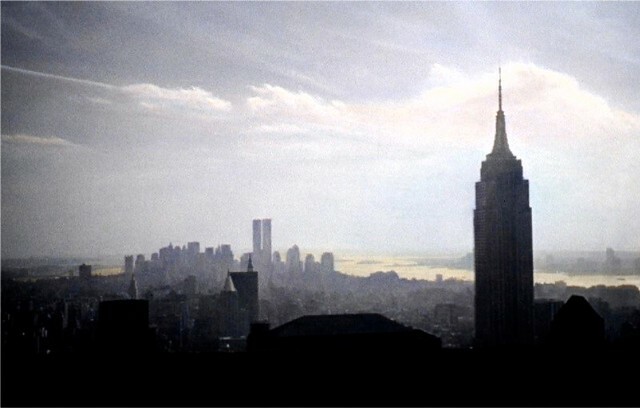 It was shot from Rockefeller Center and and the Towers are in the distance: small, far away, and fading with the light. Most photos of the WTC show it looming, but Ann captured it looking soft and, if only in hindsight, vulnerable.